Wednesday, Feb. 13: TeenSTAR: Pediatrics and Fertility Care by Dr. Elizabeth Heyne, PA-C, PsyD., Room S1.402. Dr. Heyne is the incoming national director of TeenSTAR, a global organization. 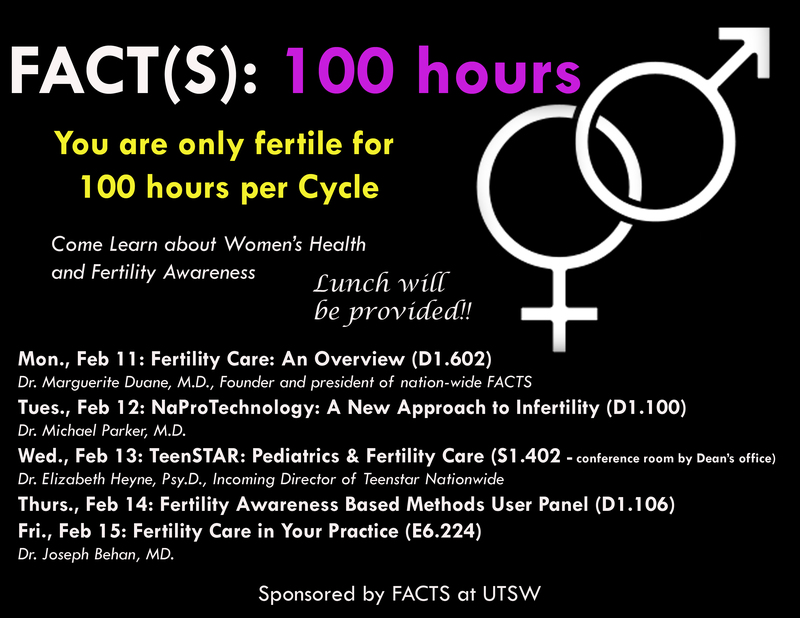 Thursday, Feb. 14: Fertility Awareness Based Methods User Panel, Room D1.106. Hear from couples and single women successfully using these methods for various reasons. Friday, Feb. 16: Fertility Care in Your Practice by Dr. Joseph Behan, MD., Room E6.224. Learn how one doctor incorporates these methods into his Ob/Gyn private practice. All times are 12:00 - 1:00 pm. All locations on South Campus. Enter from Butler and Harry Hines Blvd. After crossing Harry Hines on Bulter, you enter campus. Take the first right after the security booth. Take the second left into the visitor lot. Walk across Bulter to a plaza. You will see signs to the classroom.